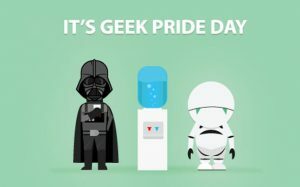 Welcome to Geek Pride Day 2018! 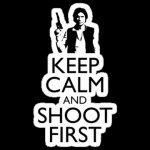 This is a day of jubilation starting back to 2008 in which we celebrate geek culture. Let’s be honest with ourselves, we are all geeks about something. Anything that you enjoy doing or something you are passionate about earns you the geek moniker. Many of us probably started earlier, like high school (or even prior to that). Back then the geek label often indicated how much smarter you are than your classmates. It also marks you as someone who may lack certain social skills, primarily because our interests were esoteric and unorthodox (comparatively speaking). 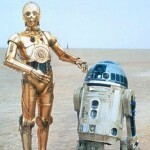 Be that as it may, there are two significant geek events that marks this day with Geek Pride. 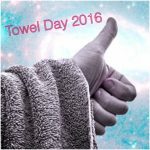 The twenty-fifth of May is the anniversary of the release of Star Wars (A New Hope) and it’s Towel Day. 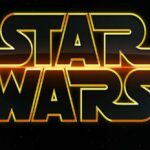 Also this year, we mark Geek Pride Day with the release of Solo: A Star Wars Story! 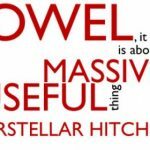 A towel, it says, is about the most massively useful thing an interstellar hitchhiker can have. Partly it has great practical value. That this putty is very well green. So long and thanks for all the fish. MTFBWY.